I usually post the edited versions of my articles that are published in Weekly Trust. 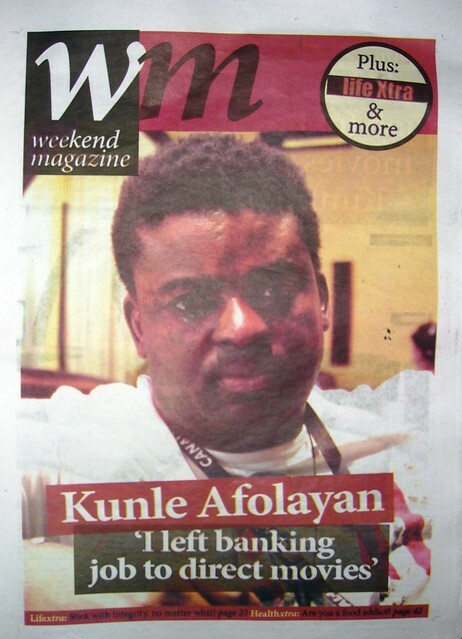 This week, however, I’m going to post the original version of my interview with Kunle Afolayan as submitted before publication in the Weekend Magazine feature of the Weekly Trust last Saturday. 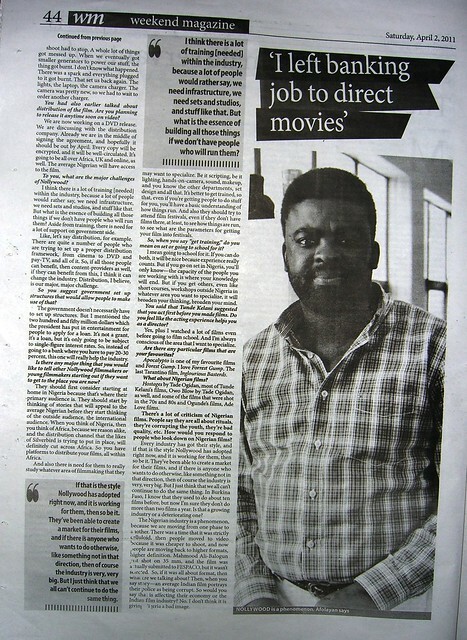 I conducted this interview the day after I met Afolayan at his first screening of The Figurine at FESPACO. Having since had more conversations with him, seen both of his feature-length films and read a lot more about the production of both, I now have deeper questions on language-use and philosophy, but this is a start. I saw Afolayan’s first feature film Irapada last night. It wasn’t as technically polished or tight as The Figurine, and I missed some of what was going on because the subtitles were too small and fast, but it was just as thought-provoking and rooted in Yoruba theatre/literature as The Figurine, if not more so. Although I disliked the synthesizer piano track, I loved the rest of the sound track which fit the mood of the film and included songs in Yoruba and Hausa, which (at least the one in Hausa) contributed ironic commentary on the story. While it may not necessarily work for a popular audience who don’t like reading subtitles, I’m a big fan of what Afolayan does with language in his films. He unapologetically switches between multiple Nigerian languages, subtitling each in English. The Figurine included Yoruba, pidgen, and standard Nigerian English. Irapada was even more ambitious in this regard with conversation in Yoruba, standard Nigerian English, Hausa, pidgen, and a short segment in Igbo. Some of this may be an influence of Afolayan’s mentor, filmmaker Tunde Kelani, whose films also make brilliant use of codeswitching. In Magun (Thunderbolt), for example, the Igbo father of Ngozi, the woman struck with the curse of magun curse, converses in Igbo with her in front of the Yoruba babalawo. (If I’m remembering correctly), Her landlady also hides her own conversation with her nephew from Ngozi by using Yoruba. There’s a dramatic irony that comes with the revelation to the audience via subtitles what is hidden through language from other characters. 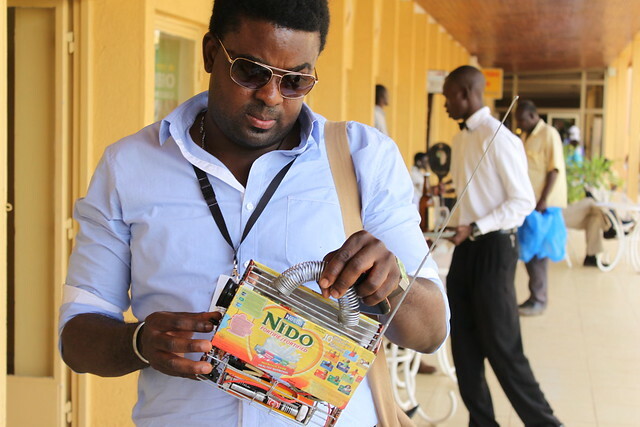 In Afolayan’s films, language flows in the way Nigerians actually use it. In The Figurine, Sola and Femi switch to Yoruba for intimate conversations; youth corpers use pidgen in informal situations at their NYSC camp; Sola and Mona use English at home in their mixed-ethnic marriage but make a point of teaching their son greetings in both languages. In Irapada, comic relief comes when the Yoruba-speaking mother of the main character Dewunmi attempts to communicate with a Hausa-speaking porter at a train station; or when the Igbo-speaking Amaka, Dewunmi’s wife’s best friend, overhears some mechanics planning to cheat her Hausa-speaking friend, Shehu. (See the trailer below for a clip of each). In addition to the use of language, you can also see Kelani’s influence in other aspects of Afolayan’s of films (although some of this could be the influence of Yoruba theatre and film in general) in the questions about destiny vs independent human choices and the nods to the many cultures that make up Nigeria. Before I paste the interview, here are trailers for Irapada and The Figurine. Enjoy. 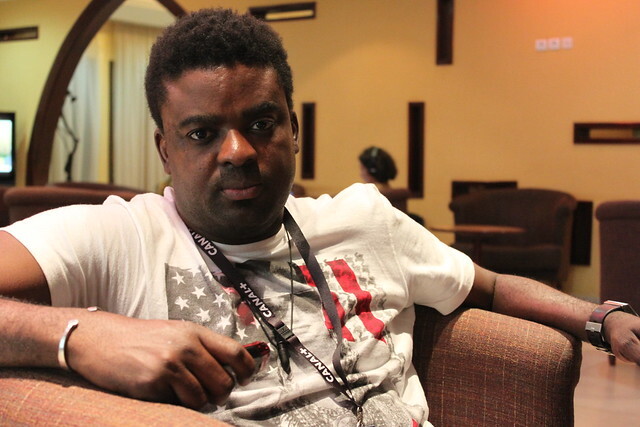 Actor, producer, and director Kunle Afolayan grew up in the richly creative environment surrounding the Yoruba travelling theatre and early Nigerian cinema, of which his father, Ade Love, was one of the pioneers; however, it wasn’t until later in life, while working as a banker, that he became interested in making films himself. 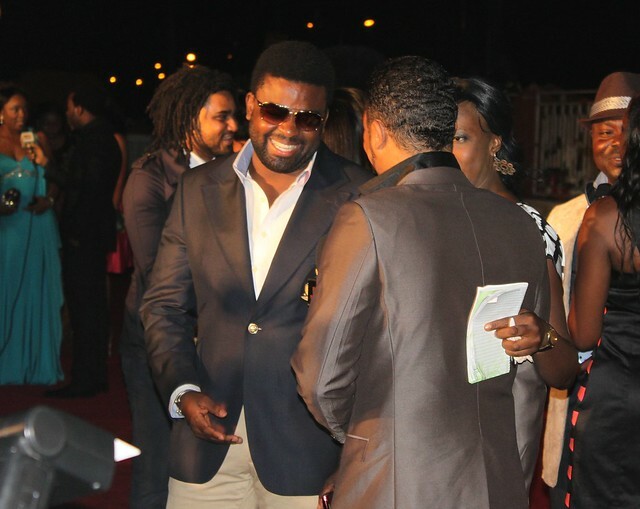 Mentored by one of Nigeria’s foremost filmmakers Tunde Kelani as he moved into an acting career and with training from the New York Film Academy, in 2010, Kunle Afolayan released his second film The Figurine, which earned him ten 2010 Africa Movie Academy Award nominations and five awards, including AMAA Best Picture Award, Heart of Africa Award for best film in Nigeria, Award for best actor in a leading role for Ramsey Nouah, Best Cinematography, and Best Achievement in Visual Effects. Carmen McCain spoke with him for the Weekly Trust on 2 March at FESPACO film festival. How and when did you become interested in film-making? I developed interest in filmmaking right from before I was an actor. All I wanted to do then was write my own story. I just felt there was a need for change in the Nigerian film industry, and I’m talking as far back as 1995. But there was no way I could achieve it because I was not a writer, I was not in any aspect of filmmaking. So, I went to Tunde Kelani, because I used to see him around when my father used to shoot film. I went to him to let my feelings be known. He said to me, “Instead of you wanting to start filming, why not start by being an actor? That might really work better.” So I said, ok, and I told him that I would like to be invited for audition, whenever they have any film. I got invited when they were going to shoot Saworoide in 1998, and I got selected to play the role. Saworoide was a blockbuster, and even up today is relevant in the Nigerian film circle. That was how I started acting. Could you tell me a little bit about your father’s films? Were you ever involved in those? I was never involved in the production. My father started as a theatre person, travelling theatre all around Nigeria and West Africa. 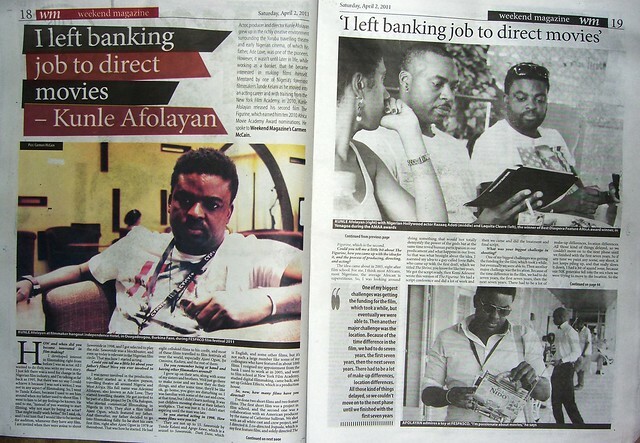 His full name was Adeyemi Afolayan, also known as Ade Love. They started travelling theatre. He got invited to be part of a film project by Dr. Ola Balogun, who started commercial filmmaking in Nigeria in 1976. They shot a film titled Ajani Ogun, which featured my father. And thereafter, my father decided to go into filmmaking fully. So he shot his own first film, right after Ajani Ogun in 1978 or thereabout. That was how he started. He had eight celluloid films to his credit, and most of these films travelled to film festivals all over the world, especially Ajani Ogun, Ija Ominira, Kadara, and the rest of them. Do you remember being at home and having other filmmakers around? Well that was the memory. Cause, I grew up—sometimes I found myself on their sets. Myself and some of my sisters and brothers. We’d just go there to make noise and see how they do their things, and after some time, they’d be like ok, go home, you guys are disturbing us. I was familiar with some of the cast and crew, at that time, but I didn’t learn nothing. It was just children messing about at their father’s workplace. That was just it. So I didn’t start aspiring until the man was late. So you started acting in 1998. How many films were you in? They are not up to 15. Saworoide by Tunde Kelani and Agogo Eewo, which is a sequel to Saworoide, Dark Days, which is English, and some other films, but it’s not such a large number like some of my colleagues who have featured in about 1000 films. I resigned my appointment from the bank in 2005, and went to film school at New York Film Academy, studied digital filmmaking, came back, and set up Golden Effects, which is a production house. How many films have you directed? I’ve done two short films and two feature films. The first short film was a project in film school, and the second one was a collaboration with an American producer by the name of Catherine Sullivan. We shot with an all white cast and crew project, and I directed it. I co-directed Irapada, which is my first feature film, and soley directed The Figurine, which is the second. Could you tell me a little bit about The Figurine, how you came up with the idea for it, and the process of producing, directing, and acting? Ok, well, the idea came about in 2005, right after film school. For me, I think most Africans, most Nigerians, an average African is superstitious. So, I was looking around doing something that would not totally demystify the power of the gods but at the same time reveal human participation in our predicament and what happens in our lives. So that was what brought about the idea. I narrated my idea to a guy called Jovie Babs, who came up with the first draft, which we titled The Shrine, you know for like two years. We got the script ready, then Kemi Adesoye wrote this version of The Figurine. We had a script conference and did a lot of work and then we came and did the treatment and final script. What was your biggest challenge in shooting? One of my biggest challenges was getting the funding for the film, which took a while, but eventually we were able to. Then another major challenge was the location. Because of the time difference in the film, we had to do seven years, the first seven years, then the next seven years. There had to be a lot of make up differences, location differences. All those kind of things delayed, so we couldn’t move on to the next phase until we finished with the first seven years. So if any time we paint any scene, any shoot, it just keeps piling up, and that really slows it down. I had a bit of sound issue, because our 50K generator fell into the sea when we were trying to move to the location. So the shoot had to stop. A whole lot of things got messed up. When we eventually got smaller generators to power our stuff, the thing got burnt. I don’t know what happened. There was a spark and everything plugged to it got burnt. That set us back again. The lights, the laptop, the camera charger. The camera was pretty new, so we had to wait to order another charger. What was the most rewarding thing for you? The most rewarding thing for me so far is the acceptance. The film has really set a new standard, not only in Nigeria, but among the other filmmakers from other regions. Don’t forget that the film got ten nominations at the most prestigious African Movie Academy Awards and won five. And the dream of an average filmmaker is to win Best Picture category in any awards. I’m glad that the film has really travelled around to so many film festivals. And as a matter of fact, it was in competition, official selection and competition in some of them like FESPACO, Pan African Film festival, etc. Any time a festival is doing a retrospective on Nollywood, they are always inviting the film to be able to differentiate between the normal Nollywood style, and the New Nollywood, that is what I call it. What kind of feedback have you gotten at other film festivals? I realized after the screening, a lot of people want to wait for question and answer, to find out how we were able to do the film. Most of them seem surprised that such a high quality film could come out of Nigeria. An example is [Kenyan author] Ngugi [wa Thiong’o] when we were in Pan-African film festival. He came with his wife, and they stayed and watched the whole film and they stayed for the question and answer. And he stood up to commend the film by saying that he feels so proud to be an African, and he wrote me a letter, recommending the film to another film festival, saying he has not seen such in a long time, even as a writer, he feels so impressed. And that is like the review from every festival we’ve been. Amakula, Rotterdam, the talent contest at Berlin, New York Africa Film Festival, Tarifa in Spain and the other ones. The same thing at FESPACO, a lot of people stayed and wanted to find out, so it has been good. So, right now, we are actually at FESPACO, and you were put in the video category rather than the main competition. Would you like to talk about that? Well, that’s like strange, because all the festivals we’ve been to, the film has always in the same category with every film, even films from Hollywood. Even big budget films worth 50 million dollars fall into the same category with this film. So it’s going to be the first time that there will be a segment for video and for 35 mm. I mean, in this age and time, a lot of people would rather shoot on cheaper format but still achieve the same high quality. A good film is a good film regardless on what format it is being shot. If it looks good, it looks good. If it sounds good, it sounds good. There are no two ways to it. So I don’t think that is fair, and I don’t think that should continue. A lot of people were bitter about this, not just me. I met with other filmmakers, and a lot of them seemed to have a bit of issue with such decision. You had also earlier talked about distribution of the film. Are you planning to release it anytime soon on video. Yeah, we are now working on dvd release. We are discussing with the distribution company. Already we are in the middle of signing the agreement, and hopefully it should be out by April. Every copy will be encrypted, and it’s going to be well circulated. We have regional distributors, national distributors in the north, south, east, west part of Nigeria. It’s going to be all over Africa, UK, and it’s going to be online as well. So, I mean, we can rest assured that an average Nigerian will have access to the film. To you, what are the major challenges of Nollywood, what does Nollywood need to do to go to the next level? I think there is a lot of training [needed] within the industry, because a lot of people would rather say, we need infrastructure, we need sets and studios, and stuff like that. But what is the essence of building all those things if we don’t have people who will run them? Aside from training, there is need for a lot of support on government side. And that is why I’m glad that the president just channeled some money, two hundred million dollars toward the entertainment industry because that will help people who’ve really gotten trained and a good business plan to really benefit from such a gesture. I believe strongly that will take the industry to the next level. Especially if the money is given to the right people who can utilize it. Like, let’s say distribution, for example. There are quite a number of people who are trying to set up a proper distribution framework, from cinema to dvd and pay-tv, and all of it. So, if all those people can benefit, then content-providers as well, if they can benefit from this, I think it can change the industry. Distribution, I believe, is our major, major challenge. If we have all these benefits in place, I believe it will help change the industry. So you suggest government set up structures that would allow people to make use of that? The government doesn’t necessarily have to set up structures. But I mentioned the two hundred and fifty million dollars which the president has put in entertainment for people to apply for a loan. It’s not a grant, it’s a loan, but it’s only going to be subject to single-figure interest rates. So, instead of going to a bank where you have to pay 20-30 percent, this one will really help the industry. Is there any major thing that you would like to tell other Nollywood filmmakers or young filmmakers starting out if they want to get to the place you are now. Well, I think they should first consider starting at home. Because their primary audience are Nigerians. They should start by thinking of stories that will appeal to the average Nigerian before they start thinking of the outside audience, the international audience. When you think of Nigeria, then you think of Africa, because we reason alike, and the distribution channel that the likes of Silverbird is trying to put in place, will definitely cut across Africa. So you have platforms to distribute your films, all within Africa. And also there is need for them to really study whatever area of filmmaking that they may want to specialize. Be it scripting, be it lighting, hands-on-camera, sound, makeup, and you know the other departments, set design and all that. It’s better to get trained, so that, even if you’re getting people to do stuff for you, you’ll have a basic understanding of how things run. And also they should try to attend film festivals, even if they don’t have films there, at least, to see how things are run, to see what are the parameters for getting your film into festivals. 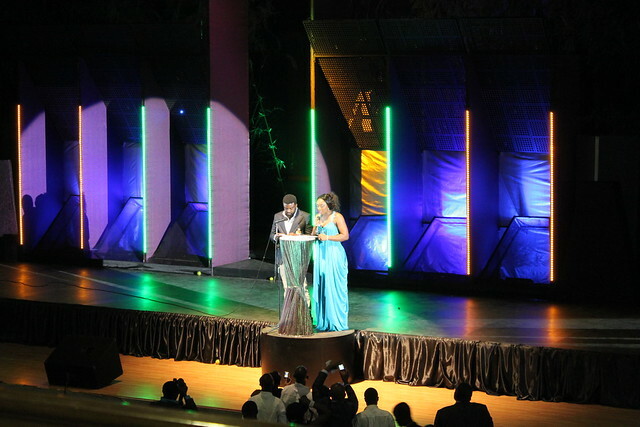 You have opportunities like AMAA awards in Nigeria. You can explore such options. So majorly, story and production value. Those are the two major things that make them have a film that will be successful commercially and will be international. So, when you say “get training,” do you mean on set or going to school for it? I mean going to school for it. If you can do both, it will be nice because experience really counts. But if you go on set in Nigeria, you’ll only know—the capacity of the people you are working with is where your knowledge will end. But if you get others, even like short courses, workshops outside Nigeria in whatever area you want to specialize, it will broaden your thinking, broaden your mind. You said that Tunde Kelani suggested that you act first before you made films. Do you feel like the acting experience helps you as a director? Yes, and the fact that I watch a lot of films, even before going to film school. And I’m always conscious of the area that I want to specialize. I picked a few directors, I look out for films that are in that genre, and I watch them, do a case study on them, so that has really helped me. Are there any particular films that are your favourites? Apocalypto is one of my favourite films and Forest Gump. I love Forest Gump. The last Tarantino film, Inglourious Basterds. Films like that. Hostages by Tade Ogidan, most of Tunde Kelani’s films, Owo Blow by Tade Ogidan, as well, and some of the films that were shot in the 70s and 80s and Ogunde’s films, Ade Love films. Along with that are there particular directors? You mentioned Tunde Kelani, what about Hollywood directors? Like I said, Tarantino, Mel Gibson, Spielberg. I like Spike Lee as well because he’s very experimental. I watch a lot of Indian films, as well. There’s a lot of criticism of Nigerian films. People say they are all about rituals, they’re corrupting the youth, they’re bad quality etc, even the idea of relegating your film to a video category, how do you respond to people who look down on Nigerian films? Well every industry has got their style, and if that is the style Nollywood has adopted right now, and it is working for them, then so be it. They’ve been able to create a market for their films, and if there is anyone who wants to do otherwise, like something not in that direction, then of course the industry is very, very big. But I just think that we all can’t continue to do the same thing. Most of those people who are criticizing. In Burkina Faso, I know that they used to do about ten films before, but now I’m sure they don’t do more than two films a year. Is that a growing industry or a deteriorating one? The Nigerian industry is a phenomenon, because we are moving from one phase to another. There was a time that it was strictly celluloid, then people moved to video because it was cheaper to shoot, and now people are moving back to higher formats, higher definition. Mahmood Ali-Balogun just shot on 35 mm, and the film was actually submitted to FESPACO, but it wasn’t selected. So, if it was all about format, then what are we talking about? Then, when you say story—an average Indian film portrays their police as being corrupt. So would you say that is affecting their economy or the Indian film industry? No. So, they should look inward and look at the best way to have a pan-African film industry, instead of condemning a growing industry from Nigeria. If people say Nigerian film are giving Nigeria a bad image, how do you respond? I don’t think it is giving Nigeria a bad image. If it was giving Nigeria a bad image, all those actors would not be celebrated all over Africa. Wherever it is they go… people are stuck on those films. That is where the Caribbeans, that is the only way they see that we actually have big houses and big cars. Those films might not be doing well in the world film circle, but commercially they are doing great. I’m not into such films but I think they are playing their own mark in the world film circle. In conclusion, is there anything you would tell an audience, anything you think they should know about Nollywood or their films. Keep supporting Nollywood, and you can get details of The Figurine from figurinemovie.com. Keep supporting Nigerian films. 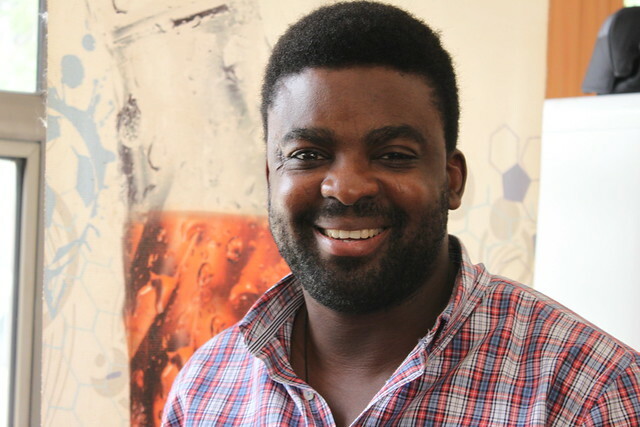 This entry was posted in African cinema, African literature, Articles of interest, Column, Nigerian film and tagged Irapada, Kunle Afolayan, The Figurine, Tunde Kelani, Weekly Trust. Bookmark the permalink. Great interview. Yesterday at our bi-weekly poetry program we discussed whether Ghanaian movies reflect life in Ghana. It was insightful. And I find some of the responses by the audience similar to that provided by Kunle relating to the image of the Country and its association with the movies.